Eight of nine students in the HSI Pathways inaugural cohort applied to Ph.D. programs this year, and all eight who applied have received multiple acceptances with offers of full funding to prestigious Ph.D. programs nationwide — an exemplary 100 percent rate. Photo by Lee Choo. Eight of nine students in the HSI Pathways inaugural cohort applied to Ph.D. programs this year, and all eight who applied have received multiple acceptances with offers of full funding to prestigious Ph.D. programs nationwide. Photo by Lee Choo. 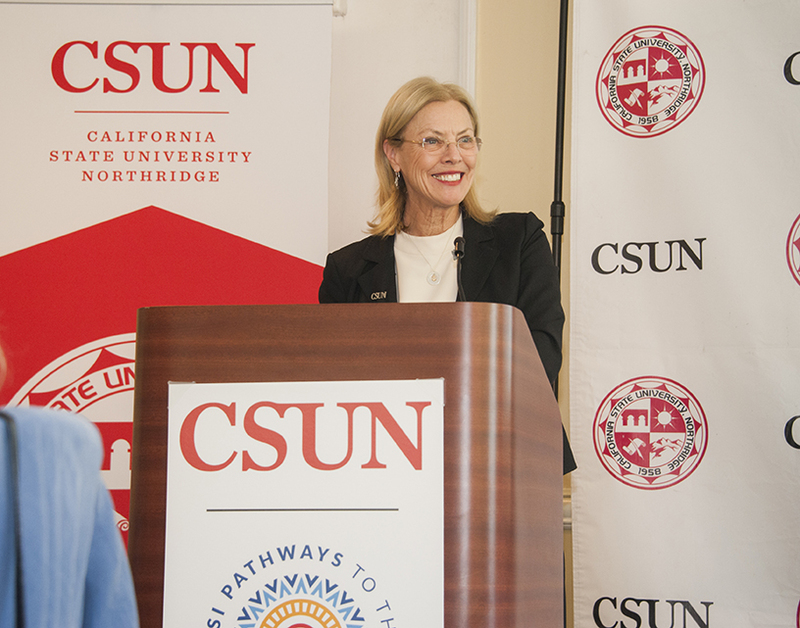 CSUN President Dianne F. Harrison speaks at an HSI Pathways event at the Orange Grove Bistro to congratulate the graduating group and introduce the second cohort. The goal of California State University, Northridge’s HSI Pathways to the Professoriate is to make the journey to becoming a professor easier to navigate for students, including Latina/o students, in the humanities and related fields. 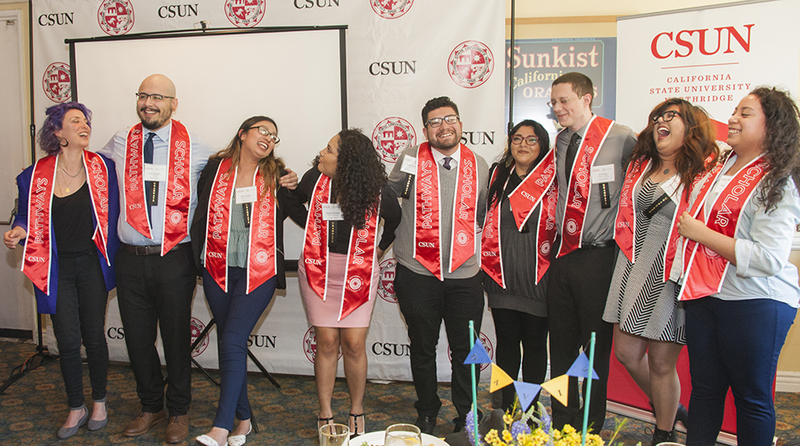 CSUN, a Hispanic Serving Institution (HSI), partners with the University of Pennsylvania Graduate School of Education’s Center for Minority Serving Institutions to increase the presence and visibility of Latina/o faculty members. HSI Pathways is open to CSUN students in their junior year whose majors match a list of specified fields, and who want to get a Ph.D. and become a professor. The cohort provides research opportunities and the preparation needed to get a doctorate. Eight of nine students in the inaugural cohort applied to Ph.D. programs this year, and all eight who applied have received multiple acceptances with offers of full funding to prestigious Ph.D. programs nationwide — an exemplary 100 percent rate. On April 20, HSI Pathways held an event at the Orange Grove Bistro to congratulate the graduating group and introduce the second cohort. In the fall, Shawntel Barreiro will be attending The Ohio State University to obtain her Ph.D. in linguistics, with a specialization in Central American sociolinguistics. Barreiro thanked HSI Pathways for getting her to where she is today. Through this intense program, Barreiro said her parents were her inspiration. She especially takes pride in being the daughter of immigrants from El Salvador, who left the country when the country’s civil war broke out in the 1980s. In 1985, her parents left everything that was familiar to them to start a new life. Barreiro wants to make sure that she uses the privilege and honor of having a Ph.D. to give back to students who come from similar backgrounds. As for being able to represent CSUN, “this program shows that its students are capable of being amazing scholars,” she said. For recipient Elizabeth Calzada, it was a big surprise to be able to receive such a prestigious award. The opportunity will allow her to attend the University of Minnesota’s history doctoral program. She decided to pursue professoriate after noticing that not many of her professors looked like her. “I want to be a professor to get more Latino representation in the professoriate,” Calzada said. “I mean you see it even here, in institutions like CSUN that is an HSI campus, there’s still a big gap [in Latina/o professors]. Imagine what the gap is like in schools that aren’t HSI, so that’s pretty huge. Receiving the full funding is even more special to Calzada, because she’s the first in her family to reach the doctorate level of higher education. For recipient Jared Diaz, college wasn’t always an option. Growing up on the autism spectrum, he had a particularly difficult time in school. Despite a difficult childhood, Diaz has now accepted an offer for a fully funded Ph.D. program at Arizona State University for religious studies. He thanks HSI Pathways for opening opportunities like these for him. Diaz explained what inspired his goal to want to be a professor. Inspired by family, a Los Angeles Latina-based poetry group and HSI Pathways colleagues, Yaquelin Morales successfully received an acceptance to the performance studies program at Northwestern University. The performance studies program analyzes performance to engage history, culture and human expression. She plans on doing ethnographic work on the performance of women’s activism. 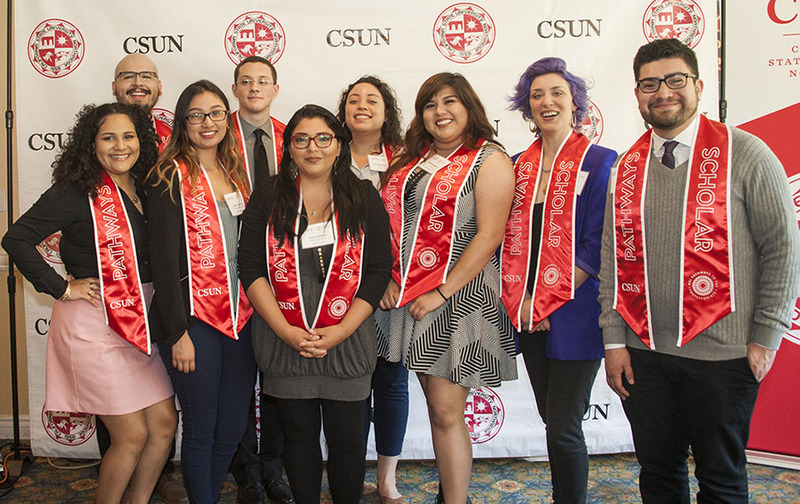 As the first in her family to attend college, Morales feels grateful for the “continuously expanding opportunities” CSUN’s HSI Pathways program has provided. She hadn’t considered a Ph.D. program until CSUN professor Melisa Galván explained the opportunity to her Gender and Women’s Studies class. “Every time somebody got an acceptance into a program, we were genuinely happy for them,” Morales said. “In many academic spaces there is a sort of competitiveness. Ultimately, everyone succeeded. Brian Mercado will be studying sociology with a concentration on education at the Graduate Center at the City University of New York next fall. “I had the sense that [New York is where] I’m meant to be, this is what I’m supposed to be doing,” said Mercado. Discussing both graduate school and the HSI Pathways program, Mercado said there was much he had learned, and he appreciated all members of his cohort, his coordinator, his mentor and everyone affiliated with the program for being his support system. For his research project, Mercado interviewed high school administrators on their perception of low-income students of color. When reflecting on the future, Brian said that his thoughts on potential dissertation topics included: drug use among students, toxic masculinity of students within school settings and using Marxist theory to relate students to the laborer and draw parallels between the processes of alienation that both groups experience. “When I was a high school senior, my mom was getting her GED while also studying for her citizenship test,” Mercado said. “That really inspired me. I love my mom. I look up to her. If she was in a different space, she could have gone so much farther. Seeing her in her 30s completing all of these things was very impactful for me. As a lover of philosophy and his Mexican culture, Rocha plans to bring non-European Western philosophies into the academic world as a future professor. Next fall, Rocha will be pursuing his goal of achieving a Ph.D. in philosophy at the University of California, Davis. One of Rocha’s mentors, Linda Alvarez, assistant professor in Central American studies at CSUN, helped him with writing and supported his application process. Rocha said he wanted to be a professor of philosophy since he was in community college. Additionally, the professors here at CSUN helped inspire him and refined his writing skills. Even though Rocha always knew he wanted to participate in a doctorate program, he was very nervous and felt underprepared. After going through a six-week-long academic bootcamp, learning important nuances of graduate school and creating the research papers which he used as his writing sample for the applications, Rocha wants other students to be aware of doctorate programs. “I knew that a Ph.D. would give me more options,” he said. “I love philosophy for what it is and that’s what I want to do. What makes HSI Pathways an esteemed program is that it emphasizes diversity. Eryn Talevich, who was homeschooled for large portion of her life, was an untraditional candidate — but what made her unique was also what got her into HSI Pathways. This fall, Talevich will be attending the University of Michigan to work toward her Ph.D. in anthropology. HSI Pathways helped Talevich prepare by offering numerous resources at CSUN. Talevich said that her goal after attaining her Ph.D. is to go into full-time teaching as a professor. Through teaching, she says she can give back to the communities she was a part of as an undergraduate. For first-generation college students, being the first to attend college can be a difficult journey into the unknown. Kiara Padilla overcame this challenge. Padilla has shown superior academic valor and will be graduating from CSUN with a double major in psychology and chicano/a studies. This fall, Padilla will also be attending the University of Minnesota for her Ph.D. in American Studies. HSI Pathways offers students like Padilla the experience to build valuable relationships with their cohort and teach important habits to keep into their doctorate process. This program will help tremendously on her journey to her Ph.D.
Padilla said she wants to be a university professor to encourage students to do research, because research is a form of social change.